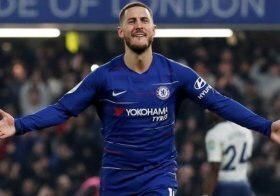 Chelsea's world-class attacker Eden Hazard, who has been persistently linked with a move to Spanish giants Real Madrid, has today insisted no deal has been agreed with the club and that he is only thinking about his current situation with the Blues. Hazard has been a target for Real for over three years. The former Lille attacker has been in close contact with former club teammate and international colleague Thibaut Courtois over a move to Madrid, but so far Hazard has resisted the temptation of a mega-money move to Spain. Instead, Hazard commented that he would not be leaving, despite reports of a five-year contract having been agreed: "There’s nothing in it. I’m only focused on the game against Cyprus." Belgium is currently in preparation for their Euro 2020 qualification campaign in which Hazard is seen as an important member of the country's squad. Chelsea have informed Hazard that they want to keep him at the club for the foreseeable future and are willing to discuss a fresh contract with the player in order to do so.